We already have some hummingbird topics going, but I thought maybe we should have one for the rest of the birds also. Last month I saw my first robins, and earlier this month, the red-winged blackbirds returned. Now, today I saw my first Brown Thrasher. It was actually eating sunflowers from under one of my feeders. It tried flying up to the feeder, but it's one of those that allow only the smaller birds to get in to it, so the Thrasher quickly gave up. Robins are here too....lots of them...I'm excited to see them...that means warmer weather!! My first Brown Thrasher arrived this week and I ran out with my daughter's Canon 6.1 Megapixel 12X Optical Zoom camera to get some shots of him. 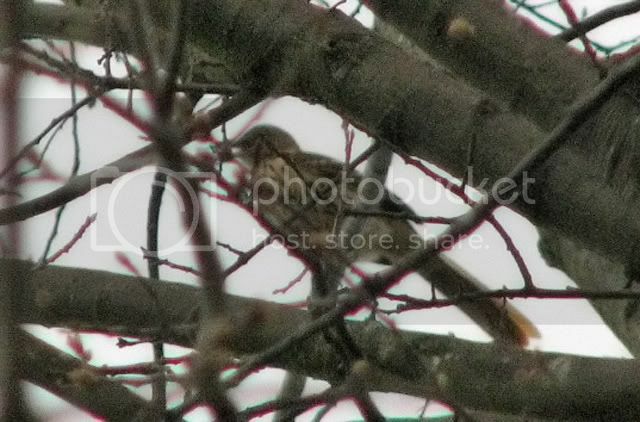 I found him in top of a 30 foot tall oak tree and took these shots from about 50 feet away. The quality is poor, but you can tell what he is. The next birds to arrive here should be Eastern Kingbirds and Louisiana Waterthrushes, sometime in the next two to three weeks. I guess this doesn't really qualify as a new arrival, especially since I didn't even see it, but last night after work as I was unloading my groceries from the car, I heard a Great-horned owl. Ooooh an Owl! Especially Great Horned......my FAVORITE OWL. I have had a Barred Owl on the roof of my house, DIRECTLY above my computer for weeks now. It comes in about Sundown and stays for hours. I can't get a picture of him......YET. Joni, You should hear the birds singing ALL night soon, Especially Robins, Northern Mockingbirds, and when they arrive, Yellow-Breasted Chats. Thorny, 2 or 3 years ago, I had a Screech Owl that stayed in a hole in a tree at my property line on the west side of my house. I could just see the top of his head from my kitchen door. The other birds HATED him. A lot of the time during the day, when he was trying to take a nap, there would be a mixed flock of them congregating near his tree just raising h***. Especially the Blue Jays. That's typical Jay and/or Crow behavior towards Screech Owls. I've never seen a Screech Owl in the wild but HAVE heard them. I've seen a few in captivity so would know one instantly. 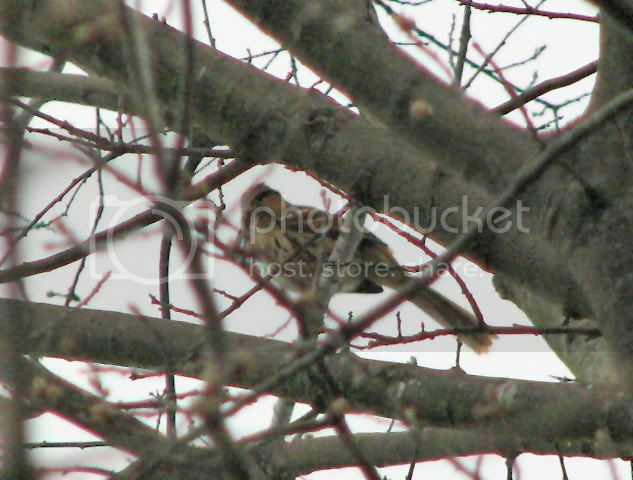 Today the Chipping Sparrows arrived, and I saw the first Flicker of the year!